Yes, we are in good mood today. After some "Peace full" days in Vienna we are back to autumn production. And back to everyday problems. We found a beautiful new design for a all season office top. What do you think? Are ponchos out of this season? Last touch ... We are openingtomorrow. We are so happy. Finally open. 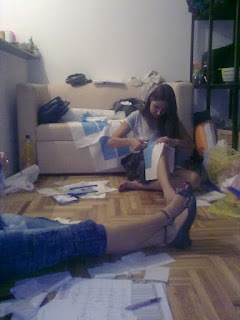 Yesterday, Jovana and Phil made a big "tour de Serbia" looking for autumn materials. We found the most fantastic green material for coat. We cannot wait to produce it. 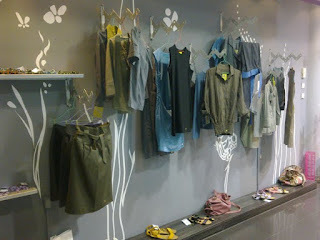 finally Vrivva in 4 new colors is her..... and this in the middle of your summer sale! The emotional birth moment of your label. Yesterday I have been working on autumn collection; actually I made the first “final” arrangement. Following questions I am not sure about, how many different models of skirts to produce. So please help me out here and give some smart commands on: if you rather go in trousers or skirt to your job and why. And how long you prefer your working skirt. We have packed our collection for our new shop in Vienna. I think it is getting a real now! Today we are connecting everything. These days we are finalizing our material choice for the autumn collection.